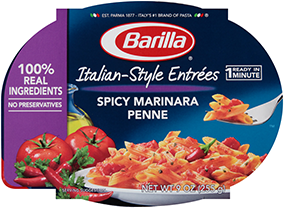 * 1 jar Barilla® Marinara sauce can be substituted for Barilla® Tuscan Herb sauce. Meanwhile, in a large skillet, sauté veggies and pancetta in olive oil for 7-8 minutes. Add meat and sauté for 7-8 minutes until meat is thoroughly cooked. Add Tuscan Herb sauce* and 1 jar of water, bring to a simmer, season with salt and pepper and cook for 10 minutes or until liquid is reduced.